Mercer Canyon Archives - Write for Wine: It's Wine O'Clock Somewhere!Write for Wine: It's Wine O'Clock Somewhere! Mercer Estates has been growing grapes in Prosser since 1972, the first to plant in Horse Heaven Hills. Of note, Block 1 later became the highly acclaimed Champoux Vineyard. But the family’s history in Prosser began in 1886, three years before Washington became a state. In 1915, the family began herding sheep; In 1958, Mercer Ranches incorporated. Wow! So it’s not surprising that we have been fans for quite a few years now, and Mercer’s recent releases continue to impress. 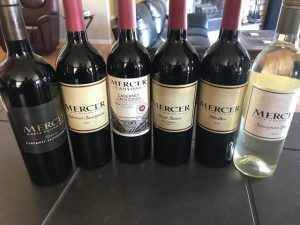 The winery produces three tiers of brands: Mercer Canyons is the most affordable; Mercer Estates is mid-range; and Mercer Reserve has the highest price point. We were fortunate to receive samples of three new releases — Malbec, Sharp Sisters Red Blend and Sauvignon Blanc, in addition to three Cab Sauvs from all three tiers. First, the new releases.